my moves gives around 16-18kmpl within city driving and 18-20kmpl on long routes easily , its a 2013 model imported in 2014 btw . I have a MOVE 2016 and the average i am getting is between 16-20 KM Per liter in City with AC. Got second tank full in my Move 2016. 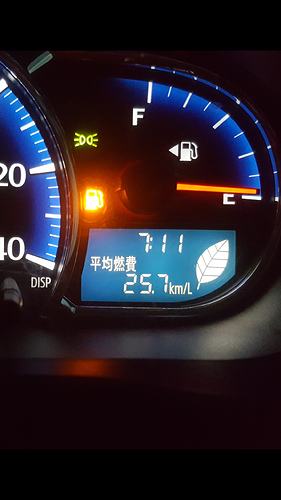 Fuel average came out to be 17.72 Km within City. My move 2016 gives 18Km per litre in city. My Daihatsu Move 2016 is giving 22 KMpl without AC. I use Synthetic oil 5w - 30 and STP fuel additives. Previously was getting around 20KMpl. I got tremendous fuel average on long 25.7Km/l without Ac. 20km/l with AC. With Eco Idle Mode On. The comfort and luxury is outclass. I purchased it in 11 lac 50k. i have move 2014 the problem that im facing is that when i turned on the AC the car loses its power it barely give any pickup and also disturbs the fuel average also. so what you guys think what is the problem ??? clean your car throwtle body then it will be ok if not then you check your car by scanner. I have also same model of move and I am also facing the same problem. As my engine stops and after that fuel average is 13 to 14 kml. Have u find any solution? Just purchased Subaru Stella 2015 same as Daihatsu Move. I am really surprised by the fuel average of vehicle. If you have soft foot, mileage you can achieve is more than 24Km/ltr in city with AC. Sir get ur catalytic converter acid washed and make sure the mechanic doesnt mess up the jalis in it.